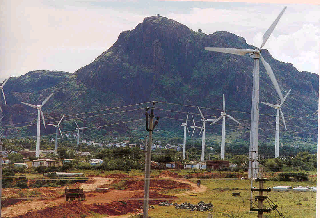 In the recently concluded round table meeting with Ministry of New and Renewable Energy(MNRE) officials, Indias major Wind energy associations - Indian Wind Turbine Manufacturers Association (IWTMA), the Indian Wind Energy Association (InWEA) and the Indian Wind Power Association (IWPA) have urged the government to take needy policy changes immediatly which will increase the wind capacity additions in the near future. This was in the time when major Wind turbine maker Suzlon Group posted a net loss of Rs 300.24 crore in the three months ended March 2012. Though Wind energy generation has reduced in major states, Wind energy in Gujrat is still steadily on the rise due good state policies. - To return back the accelerated depreciation which was discontinued, by implementing some of the needy modifications, as those modifications would accelarate investments by medium and small scale enterprises. - Associations stressed the need for a single window clearance for wind farms in all states and a policy on repowering old wind farms, which are spread accross south India. - State electricity boards must be ordered to compulsorly buy ppower through Power purchase agreements (PPA), based on the CERC (Central Electricity Regulatory Commission) norms and deployment of the national clean energy fund (NCEF) for the wind energy sector.